ABUJA- MOVES by the Senate to nip in the bud increasing cases of Sickle Cell disease in the country, Tuesday got a boost as a Bill for an Act to provide for Compulsory Haemoglobin-Genotye Testing and for other connected matters scaled second reading. 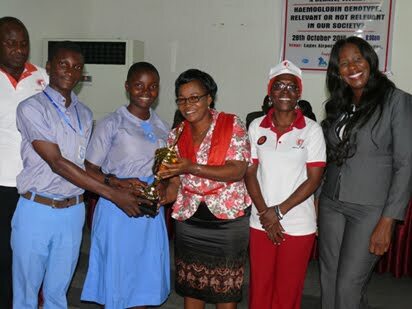 Genotype Foundation & Pfizer educate students about their genotype The bill which is sponsored by Senator Ahmed Ogembe, PDP, Kogi Central and Co- Sponsored by Senator Ovie Omo- Agege, APC, Delta Central, was first read on March 28, 2017. The bill seeks to provide for compulsory haemoglobin-Genotype screening before a marriage is conducted under the Marriage Act and before registration of new births under the Birth, Death etc Compulsory Registration Act. Leading debate on the bill, Ogembe who noted that the objective of the bill was to establish a clear legislative framework for effective management of Sickle Cell disease, which results from mismatch of couples’ genotype, said that the bill has become necessary following the untold pains suffered by people living with Sickle Cell disease. He said: “We simply want to avoid human anxiety, pains and death as related to Sickle Cell disease. We want to improve the lives of often forgotten citizens who live with it. Unknown to many, it is one of the biggest public health problems in Nigeria. Nigeria from reports, is known to have the greatest number of sickle cell disease in the world. “The picture is brought into sharper focus when we consider the finding by the American Centre for Disease Control and Prevention that slightly above 300,000 babies globally are born with sever sickle cell diseases. 225,000 are born in Sub-Sahara Africa, representing 75 per cent of the global figure. He said that the disease could be avoided with proper awareness, stressing that it would be unfair to bring children into the world to live in unbearable pain all their lives. On whether or not the bill contradicted the provisions of the Constitution, the lawmaker said it was founded on strong constitutional basis, adding,” With regard to the legal basis, a few may think that this bill may breach the right to private and family life as enshrined in Section 37 of the 1999 Constitution. This is not correct. “Section 45(1) of the Constitution states that nothing in Section 37 shall invalidate any law that is reasonably justifiable in a democratic society in the interest of defence, public safety, public order, public morality or public health. Contributing, lawmakers lauded the bill, saying it would help to protect unborn children from the excruciating pains associated with the disease, just as they described the disease as an unnecessary, as it could be avoided with proper awareness on the need for intending couples to undergo test. According them, while the prevalence of the disease is on the decrease in other countries, same is not to be said of Nigeria, which according to records has the highest number of people living with the disease. In his remarks, Senate President Bukola Saraki who referred the bill to the Committee on Health to be returned to Senate in four weeks, urged the committee to merge the bill with one currently before it to come up with a single bill that would address the problem.